It's December, which means the time has come to kick off the year-end retrospectives. To start, we're going to take a look at the hottest and best selling pedals to make their way through the pages of Reverb over the past year. If you look on the right, you'll see the list of the most popular new releases, all of which debuted at some point in 2015. On the left, you'll see the overall best sellers, which are made up entirely of tried-and-true standards that continue to dominate the pedal market. All this info comes from our internal Price Guide records and reflect sales for both new and used pedals. 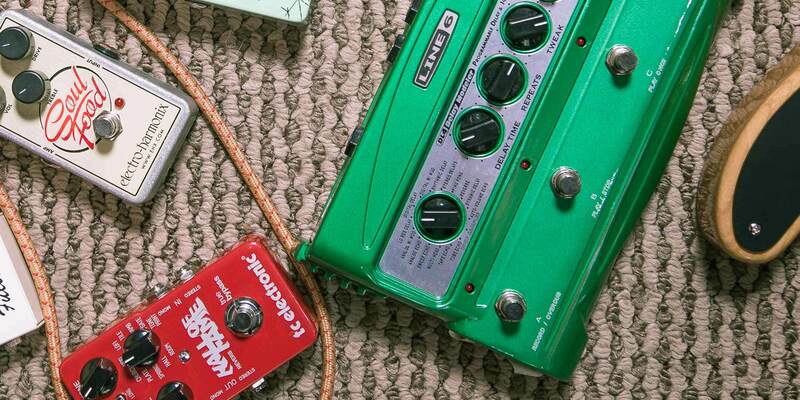 Which pedal made your 2015 tone quest come alive? Let us know in the comments. With the mini pedal revolution at hand...er...foot it was only a matter of time before Ibanez put the most popular drive pedal of them all into an adorably diminutive enclosure. The TS Mini packs everything you, Trey Anastasio and SRV love about the Tube Screamer into a small package with a small price to match. If you're thinking about adding a new Tube Screamer to the family, you might as well make it a mini. Since it's release two years ago, the Ditto Looper's reputation has evolved from useful novelty to pedalboard essential. This one-button, foolproof looper is unquestionably one of those pedals that everyone needs, whether they're a guitarist, keyboardist, electric bassoonist or a player of anything with an output jack. And if you don't have an output jack, the newer XLR version has you covered. Loop stations are all well and good, but if you really need the full band-in-a-box treatment, you should consider the DigiTech Trio. This pedal instantly endows your rig with a bass line and drum beat to match your guitar playing with one of seven genres and 12 styles. Be sure to check out our set of videos on the Trio for a taste of why this pedal ranks so high in the 2015 standings. In bringing the genre-defining Klon-style circuit to the masses, the Soul Food has become less of a pedal and more of a social movement for guitarists. This thing continues to win shootouts and force players to abandon long-standing boutique favorites in the face of an affordable little box that sounds just that good. The EHX POG 2 and Micro POG are consistently hot performers in the used pedal market thanks to their rich, organ-like octave generating powers. The Nano POG — the newest member of the POG family — takes the controls of the Micro and slims everything down for more flexible pedalboard placement. The unyielding popularity of MXR Carbon Copy proves its undeniable station as the default analog delay pedal on the market. There are strong contenders for the slot in the form of the TC Electronic Flashback and Way Huge Aqua Puss, but the Carbon Copy's reliably dark and immersive trails keep it going strong year after year...year...year...year. While other pedals on this list are more or less improved or repackaged variations on old themes, the Warped Vinyl from Chase Bliss Audio offers players something unique: a simulation of the sound of an old spinning record. The Warped Vinyl is technically a combination chorus-vibrato and relies on digital control of an analog signal path. The most popular style of reverb used in pop and rock music is always changing, but if you need a pedal that can do them all, the Hall of Fame is a solid choice. It packs ten distinct reverb modes along with a setting for TC's TonePrint library to beam additional sounds and custom settings from your phone or computer. The long-time favorite Boss RV-5 showed no sign of slowing down so it was something of a surprise at Summer NAMM this year when Boss introduced the RV-6. This latest digital reverb reworks the algorithms for more realistic reverbs while adding some new tricks like a blended delay mode. In an ever widening sea of transparent overdrives, the Paul Cochrane Timmy stands proud as the pedal of choice for a huge array of players. This is a great option for those who crave a rich clean boost and full-on breakup while maintaining the organic sound of your amp. Old Blood Noise is clearly a boutique company to watch and the haunting Procession Reverb is not their only design to rank high on the list. This pedal is more than a reverb. It incorporates three modulation modes to turn the base effect into something other-worldly and entirely new. There are some pedals that everyone needs and one of those is a tuning pedal. The Polytune's quick and easy mechanism to see the status of all your strings at once has made it a clear favorite in recent years. The Cry Baby mini is more than just your standard Dunlop in a smaller enclosure. This wah offers three selectable voicings for either "low" and "vintage," as well as a more modern circuit based on the standard CCB-95. For years now, the Line 6 DL4 has granted instant access to virtually every delay type you'd ever need with simple looping capabilities tossed in for good measure. If you're a guitarist, there's no excuse not to play around with this one delay to rule them all. Not only is the Walrus Audio Bellwether a highly flexible delay with 1000ms of delay time on tap, it also sports a dedicate chorus circuit for an added dose of modulating goodness. In replicating the preamp section of a vintage Echoplex Tape Delay, the Xotic EP Booster is an instant jolt of magical vintage tone shot straight into the arm of your board. From the lowly DD-3 to the DD-7 and DD-20, Boss has a knack for delays that can do it all. Enter the DD-500, which takes this pattern to a whole new level with deep digital control over every delay parameter you can imagine. The classic, the original, the Ibanez Tube Screamer. Even if you've never played through one, you've certainly heard a TS9 on record. If you're just getting into effects, look here for your first overdrive. There are a lot of "Klones" out there but few that master the overdriven majesty that toneheads really crave. The Archer IKON from J. Rockett is one of them. As one plucky Reverber put it, it's "klone tone without taking out loans." If you're looking to make noise or get in on that whole shoegaze thing, the Giga Delay will do you well. This delay is highly customizable with four presets, and 11 delay modes including a noisetastic reverse setting. The unyielding popularity of MXR Carbo Copy proves its undeniable station as the default analog delay pedal on the market. There are strong contenders for the slot in the form of the TC Electronic Flashback and Way Huge Aqua Puss, but the Carbon Copy's reliably dark and immersive trails keep it going strong year after year...year...year...year.